Our establishment was founded toward the end of the Edo Period. Originally we operated a sword depository, where samurai visiting the Shogunate would check their swords, but this enterprise collapsed when swords were outlawed in 1876, and we went on to open a roadhouse type of shop serving sake and broiled eel. 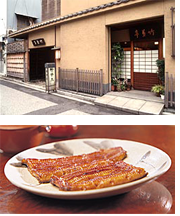 “Kabayaki”–broiled eel–is prepared by slitting the eel down the back, sticking it on skewers, and after steaming it well, broiling it while basting with a simple sauce, and Chikuyotei kabayaki became a big hit. Our original building was destroyed in the Kanto Earthquake of 1923, and in 1925 we moved to our present location in Ginza, 8 Chome. In the old Edo atmosphere of our dining room you can enjoy our unique flavor, unchanged for 150 years.